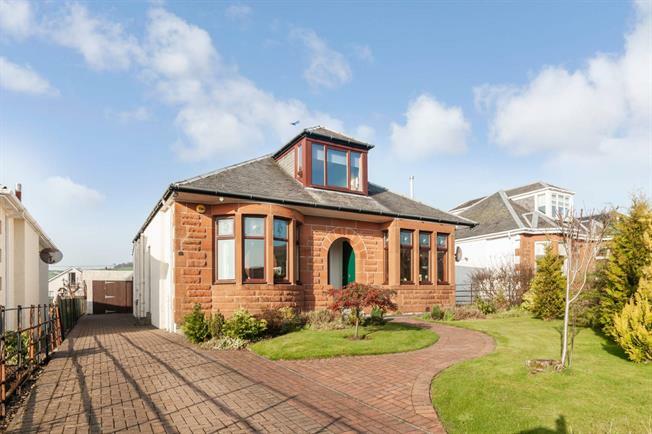 4 Bedroom Detached Bungalow For Sale in Largs for Offers Over £285,000. Excellent example of a sympathetically modernised, larger-style traditional detached bungalow located within an established residential locale of this popular coastal town. Considerably improved by the current owners in recent years viewing is highly recommended of this quality family home complete with extensive, level garden grounds and which is also within minutes walk of the new Largs Campus. In more exacting detail the immaculately presented accommodation on offer comprises: central reception hall, delightful square bay windowed lounge, superb and stylish, well-proportioned dining kitchen with range-style cooker and cast iron wood burner. Conservatory, utility, master bedroom and shower room complete the ground floor. Upstairs leads to the first floor landing where there are three additional bedrooms and bathroom. The property has gas central heating and double glazing. Externally, there is a substantial garage with generous, mono bloc driveway parking to the front of the garage and side of the house.